Being constantly surrounded by “stuff” overstimulates the brain, leads to increased stress, creates anxiety and leads to feelings of guilt**. With that in mind, to get the most out of every day and free up some headspace it makes sense to regularly declutter our work spaces. A decluttered workspace can increase headspace and productivity, as well as free up more time, more space and subsequently you will be more organised and your space will be easier to clean. Here are my ten key tips for decluttering your workspaces. This example outlines decluttering your office desk, but the same method of decluttering can be used for any area of your work space – store room, stationery cupboard, tea room. It’s a date! Book time in your diary for this task and don’t cancel – At the allotted time, set an hour on the timer on your phone and get started. Making a clear commitment to declutter your workspace will ensure your success. Start with a clear slate: take everything off your desk and put it in a box. 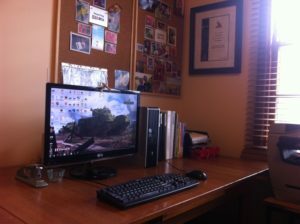 My clients find that trying to declutter one item at a time from their messy desk can be overwhelming. Clearing everything off with the desk with give a clear space for your eyes to rest (not so much clutter to process). This step alone will give you a great sense of achievement and encouragement to keep going. Cleanse your space: Once everything has been taken off your desk, give the surface of your desk a good wipe-down to get rid of all the “dust bunnies” and crumbs from eating-on-the-run at your desk. Also, take this opportunity to wipe down your computer screen, keyboard and mouse. Once this is done you will have a clear and clean space to work from. – Does this item need to go back on the desk? – Do you need it at all? Do you have an electronic version of the document that you can reference and consequently put the printout in the recycling? – Can it be stored elsewhere out of site? Remember we are trying to clear the clutter to free up some headspace for productive projects. – Is the item frequently used? If yes, find a handy space on your desk, or nearby drawer or shelf to keep it. Gather “like items”: As you sort through the belongings in the box, sort “like items” together. You will start to see some natural organisation occur as you put pens, paper, folders together. Consider putting these “like items” in a box or container to keep them sorted. A home for everything: Be specific about where you want to keep the items that are in your workspace. The old adage of “a place for everything and everything in it’s place” is the key to this step of decluttering your workspace. If you need extra motivation, make labels on the shelves or desk space. You will soon save time in your busy schedule by being able to find a green highlighter without looking too hard for it. However, don’t be tempted to over complicate your systems. Each new home needs to be easy to access and replicate every time (you don’t want to have to lift up 3 items to get to the thing on the bottom of the pile). Catch the 5pm bus: Once you get everything back on your desk, set a reminder in your calendar at the same time at the end of each day to stop work and put things back where they belong. The idea of the 5pm bus that you need to do it or the opportunity will pass you as the bus won’t wait for you! Maintaining this clear space is a great habit to get into, gives you a daily sense of accomplishment and makes space for more creativity as your brain is not processing all that stimuli from unfinished jobs and clutter. One project at a time: there has been a lot of research in the US on the ineffectiveness of multi tasking. As explained by Nancy K. Napier Ph.D. in her article, The Myth of Multitasking in Psychology Today “Each time we move from hearing music to writing a text or talking to someone, there is a stop/start process that goes on in the brain.” Make an effort to work on one project at a time to be more productive. Going one step further than working on one project at a time take time at the end of each project to put resources back where they belong so you can start the next project with a clean and clear slate. This is not a dumping area: if you need more motivation to stay tidy, print yourself a sign and stick it on your desk so you’re not tempted to just dump and move on to the next project, you’ll be surprised how well this simple trick works! So, go on, schedule some time in your diary to declutter your desk to free up some headspace and see how productive you can be in your decluttered and revitalised office space.